Create a simple car with a frame and wheels attached to it using suspension joints. Enable car movement using joint motors. Use keyboard to control car movement. Create car geometry: frame and wheels. Assign rigid bodies and collision shapes to the frame and all the wheels. Set up masses for the wheels and the frame. Do not use real masses (e.g. 2000 kg for the frame and 10 kg for the wheels), as joints may become unstable! It might be better to use 64 kg for the body and 25 kg for each wheel to provide realistic behavior. Connect the wheels to the frame using suspension joints. Set up joint parameters. Enable car movement using joint motors and assign movement control to corresponding keyboard keys. Now, using these functions we can create our car. 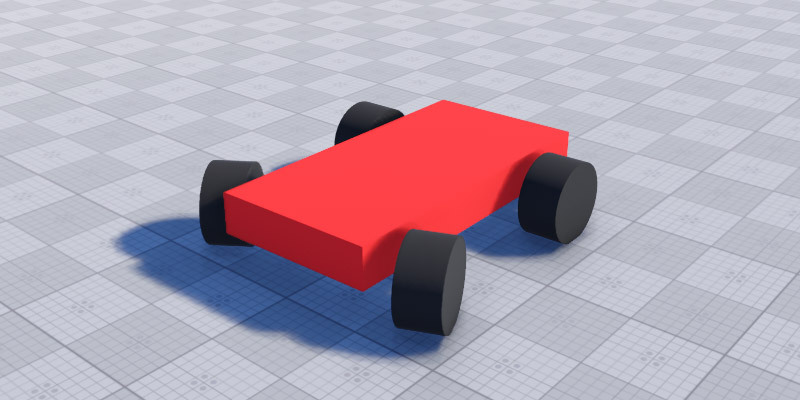 We are going to use DynamicMesh objects for the frame and four wheels. For a proper mass balance let us set frame mass equal to 64 kg and the mass of each wheel - to 25 kg. Now that we have the frame and four wheels we can attach each wheel to the frame with a suspension joint. To extract wheel translation we can multiply wheel transformation matrix by a vec3 zero-vector. So, we have a car, let us make it move now. setting a positive velocity value will move our car forward. setting a negative velocity value will move our car backward. To add keyboard control we are going to make a handler for the keys that we need. The handler must be put to the world script update() function to be called for each frame. We are going to update car physics (joint motors) in the flush() method. In the AppWorldLogic.h file, define our car.